Teachers are unsung heroes. Parents rely on teachers to teach and care for their children five days a week for seven to eight hours a day. Without teachers, many children would not learn what it takes to graduate high school and go on to college. While it’s important to appreciate your child’s teachers all year long, there is a week designated as teacher appreciation week whereby everyone can let their favorite teachers know how much they appreciate what they do for kids, day in and day out. Coming up with a theme for teacher appreciation week might make it easier to tie all of your plans together. The theme may even inspire new ideas that you may not have thought of had you not come up with a theme. These five blog entries can help you come up with a theme for your teacher appreciation week festivities. There are many different things you can do for your teachers during teacher appreciation week without spending a lot of money. Maybe you can wash all of the teacher’s cars. Or you can have parents donate food for a potluck. If you ask, maybe you could get a local business to donate food for a special treat day. The kids can make cards or bring flowers for the teacher on a different day. Little things can add up and mean a lot to your teachers. Take a look at these five blog posts and see if you can find any ideas that appeal to you. When you make gifts for your child’s teachers you will be putting a little bit of yourself into each gift. It will be personalized for her and not something that she will receive from 10 other students. Try to make the gifts useful, like making her a grocery bag. She would think of you every time she used the bag to carry home groceries. Think how many years it would last. Now that many teachers are getting an iPad and other types of tablets, they might need to have a sleeve to protect it. These ideas and others can be found in these five blog posts. For a special touch to your teacher appreciation week, find a way to publicly recognize your teachers. Maybe you put an ad in the paper thanking all of the teachers at your school. You can also recognize them in other ways, like plaques or awards. Check out these five blog entries for more ideas. Sometimes teachers receive a lot of gifts that they can’t really use. How many candles do you really need? When asked, teachers will most likely say that it’s the thought that counts, but if they are honest they would tell you that gift cards are always appreciated. These five blog entries share ideas for gifts using store bought items put together in a creative way. In this economy, the budget to celebrate might be on the small side. You can find things to do for the teachers that will pamper them without breaking the bank. Instead of catering a lunch in, see if you can get parents to bring in a covered dish. 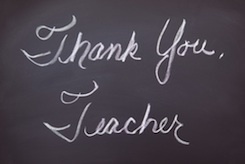 For other ideas on how to celebrate teacher appreciation week on budget check out these five blog articles. YAY! It’s Teacher Appreciation Week! Teacher Appreciation Week: Frugal Gift Ideas!